You also know it’s gonna be a scary game when the first three minutes of playtime make the hairs stand up on the back of your neck, and create a sensation of icy fingers running along your spine. Roots of Insanity taught me something about myself very quickly: I am not brave. Not in the least. In fact, I may be the poster child for chickens everywhere. I may have given myself whiplash trying to play the game wearing headphones while simultaneously trying to watch the door behind me to make sure no bloody zombie-creepy-crawler was trying to bite my ankles. While the graphics are not the best (the blood looks quite a bit more like wet, red, fetish-like latex than actual blood — this ain’t Silent Hill here) Crania Games did such a thorough job with the soundtrack — squishes, screams, and other spine-tingling and not-at-all-normal noises — that I quickly forgot about my concern over latex-like blood. Furthermore, I shall be promptly sending Crania Games a bill for my newly hired psychologist. Roots of Insanity is the debut title of Crania Games, a development studio based out of Turkey. You can tell the development team put a lot of tender love and care into their pilot endeavor, and I’m honestly excited to see what they do next. Their vibe is incredibly humble, and they seem to desire to not only provide a solid gaming experience but also share the process with their fans. If you visit their website, they offer a ton of information on how the game was born, and the ways they devised those completely gory images that are still bothering me when I have to go to the bathroom in the middle of the night. 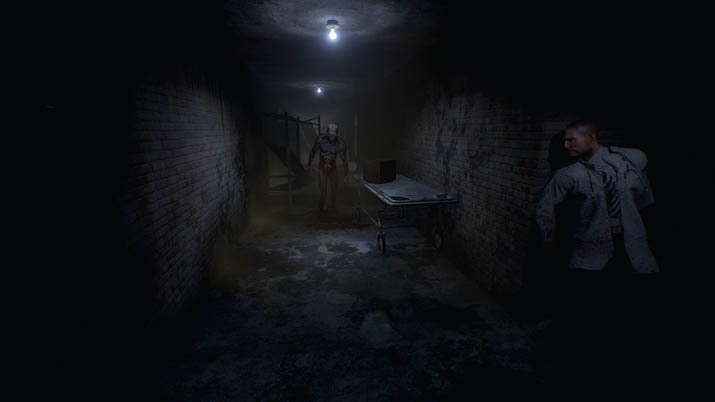 Roots of Insanity is a survival-horror FPS (first person shooter), with a lot of emphasis on survival; after all, you play as a doctor, not a Navy S.E.A.L. You must play this title with that in mind. You begin the FPS in the obligatory generic hospital, and are startled by the aforementioned terror-stricken scream. This scream also just so happens to trigger an epileptic seizure for your character. After regaining awareness, you, Dr. Riley McClein, find yourself in a nightmare. Nothing is as it should be; the hospital looks like a war zone, and the power is out. This release was perfect for me and my impatience, because pop-ups tell you precisely what to do and where to look throughout the campaign. I like this when I’m having the ish scared out of me. It becomes one less thing to worry about while you are making your way through the mess of a hospital. The oogy-boogies jump out at you immediately, and one of the more awkward parts of this game is that Dr. Riley McClein is not a fighter. I would guess that he was always picked last in gym class, as he is pretty much worthless. Evasion is best if possible, but even though you are told to evade, sometimes it is not at all possible, and you must stand and fight the zombies. Or rather, run like heck and fight whenever necessary. As you work your way through the rubble, you will also be blasted by epileptic attacks. The protagonist always needs and searches for medication, and there is never enough — trust me. I know the combat vs. amount of drugs lying around has taken some criticism, but I was OK with it. This release does an excellent job of making an unrealistic event more realistic. C’mon: if we are really in the middle of a Zombie-Apocalypse mess, is the medication particular to your condition going to be lying about in piles with little “Eat Me” signs on it?! We're talking survival horror, folks. The key here is to survive. 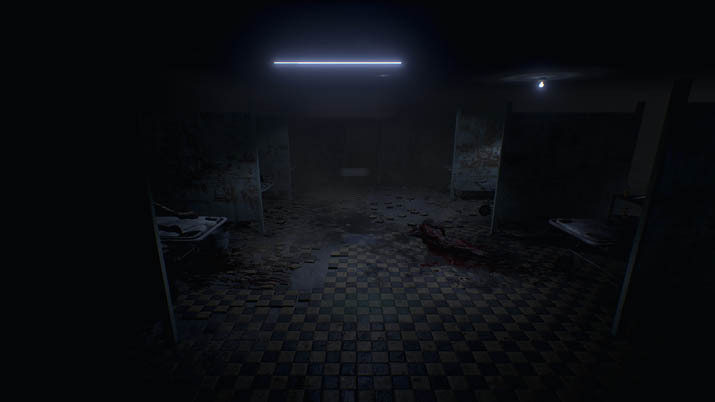 As you progress through the hospital, clues start to surface that maybe not all is right here (other than the zombies, and dead bodies littering the place). There’s talk of experiments, along with super creepy flashes of an alternate reality appear before and during each seizure. As the seizures are happening, Dr. Riley glimpses images flickering in and out of sight. Be prepared, because when the attacks stop, the flickering images warp into monsters that are trying to rip out your throat. These flashes create quite an air of tension, as you wonder what is happening, and you begin to feel a bit crazy. The word “insanity” does appear in the title, after all. Your protagonist will find a camcorder; once you reach the dark areas [EN: Jurassic Park for the SNES], you will need this. Be aware — the batteries run out ridiculously fast, so use the camcorder sparingly. Armed with a knife that the doctor uses like a child uses a stick to poke something yucky, rather than how a warrior wields a weapon to take down an enemy, you are sent back and forth to the hospital to find different objects and quest items. At one point, you have to go outside where, oh, horror, the cataclysm has spread. You eventually find a gun, but it can't be used indoors, and honestly, the gun is less effective than the melee option (...the stick-knife). 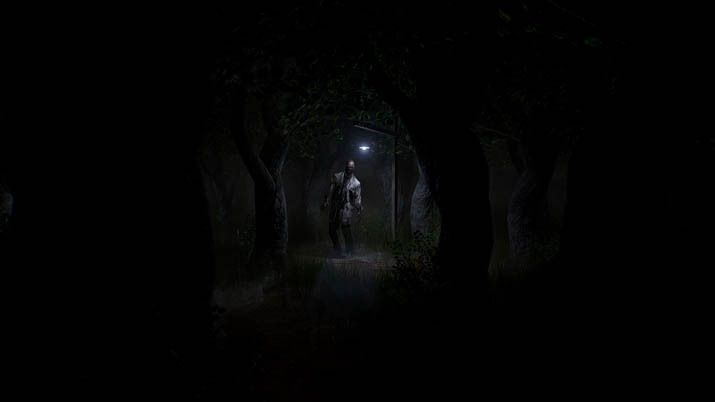 The biggest qualm I have with this survival-horror is that there is no map in Roots of Insanity, so even though there are clear directions on what to look for and where to go, nothing is telling you how to get there; you must rely on your memory. It became quite confusing at times, and there are certain periods it will be a little unclear as to what you need to do next. If you want a good time killer, look no further. While there are obvious flaws, such as difficulty in combat, and balance in elements of gameplay, Roots of Insanity is replayable fun. I recommend playing with headphones; you will hear noises — scary noises — and it’s impossible to decipher their location. I felt legitimate nervousness every time I opened a door (and there were a lot of doors). I got stuck quite a few times, swore quite a few more, and scared myself during the times I wasn’t frustrated. I was taken somewhere else while playing Roots of Insanity and, while not the most original release, it has particular good points, and an interesting perspective — even after the game was done and finished, I was still not quite sure what had just happened. Instead of making me crazy with anger, it made me sigh and want more, as I roll my eyes at my own sadomasochistic nature.